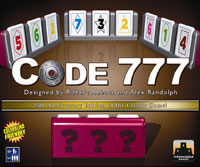 The players each receive a rack, a sheet from the notepad, and a CODE 777™ card. Each player then takes three tiles placing them on their rack facing away so that the player cannot see the numbers. The numbers on the tiles must be fully visible to all the other players. Each player can now see the numbers of all his opponents but not those in his own rack. The Question cards and the tiles are shuffled and placed face down in the center of the play area. In turn, each player takes the top question card from the stack, reads it out loud and answers the question asked. The question is about the numbers that the player can see and not about the numbers on his own rack. For example, a question may be, "Do you see more blue sevens or more sevens of a different color?" The answer may be "More blue" or "More of a different colour" or "Just as many" (this is the answer if there are the same numbers of sevens or if there are no sevens at all). The player simply counts the tiles indicated by the question and provides the answer to all other players. Each answer gives everyone, except the reader, a bit more information. If a player thinks that he knows the numbers on his rack, he can guess the solution. One point is awarded for a correct solution. No points are scored for a wrong solution. In both cases the tiles are taken out of the player's rack, and replaced by three new ones. The first player to score three points is the winner. I fell instantly for this game when I tried it out, but then again I’m the type of geek who enjoys this type of game. I don’t think it’s for everyone, and I was a bit concerned that my wife would never agree to play and that it would only gather dust in the book shelf. However, she agreed to try it out and afterwards she said it was more fun than she imagined, and she’s been enjoying other session since then (although she’s not as big a fan of the game as I am). Why am I wasting space in this review by writing this? Simply to suggest that this game actually is more fun than one might think before trying it out. Give it a shot even if your gut feeling is that it is as fun as a math lecture. Every clue makes the player think hard if they can eliminate number candidates or make clever conclusions they can combine to extract more info later. Also, some clues will prove more useful than others, especially to certain players, so luck will stir things up a bit. Not knowing how close your opponents are to guessing their numbers helps with the suspence, and may make some players try an estimated guess before they are certain. I think this game shouldn’t be played to often or it will become dull, but I cherish it and will gladly play every now and then. Especially when fellow geeks are visitng. Code 7 is a fun and fairly unique deduction game, guessing which three numbers you are displaying to the other players (which you cannot see). This is done by reading off question cards and listening carefully to the answers you hear. There are bound to be times when the luck of the draw heavily favors a certain person (I’ve seen someone win in as little as three questions read), but in general luck does not play too big of a role. I tend to only enjoy deduction games like this where the information on hand is not constantly changing (as in Mystery of the Abbey), though, like most other deduction games, any wrong answers given by the players will most likely ruin the game. The components are nice, though I wish they had integrated the summary card into the back of each of the tray holders. Add a Review for "Code 777"